Neutral packing, 12 liter bottles per carton. 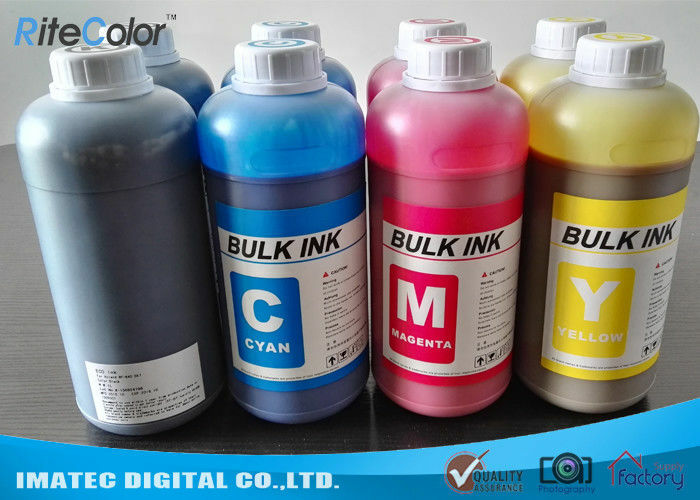 We supply sorts of eco solvent inks for various printer brands, including Epson, Mutoh, Mimaki and Roland. The inks is especially designed to provide a close match in color and image quality to the original inks. These inks are highly durable, environmentally friendly and available in a wide variety of colors, and it is odorless, environment friendly. Our Eco Solvent ink is less harsh on print heads, which has no damage to your printheads and systems. Delivery Term FedEx, DHL, Air cargo, Sea shipment etc. Eco Solvent inks is ideal for billboards and other forms of outdoor signage display printing. The ink is highly durable and compatible with both coated and uncoated media, producing high resolution images that are ideal for billboards and other forms of outdoor signage. The inks is compatible with DX-7, DX-5, DX-4 printheads. Payment Term T/T, PayPal, Western Union etc. Imatec Digital Co., Ltd. is a professional supplier in the field of large format printing industry since the year of 2008, positioning at high-end standards, with focusing on integrated Printing Solutions. Imatec supply Inks solution, inkjet media, and technical support for wide format printers. Pursuing high grade quality, welcome to choose Imatec as your partner. We will bring you with the fantastic printing experience.